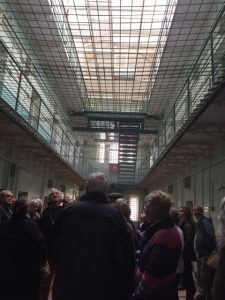 On Wednesday 12th October a small group of Society members and sponsors were lucky enough to visit the now defunct Cornhill Prison in Shepton Mallet. The visit organised by our Hon Sec. Bill Bartlett with City and Country, the developers who now own the prison, was both interesting and informative. Our guides for the tour were husband and wife team: Laura and Graham, two former prison officers who had each worked at the prison for 15 years. They led the group of 40 through the various blocks explaining some of the history as well explaining what life inside the prison was like. They pointed out where the gallows had been housed and where there were bullet holes in the walls. We learnt how it was used by the US Military during World War 2 for executions. During this period it held its highest number of prisoners ever with some ‘camping’ in the exercise yard. Also during WWII it housed historically important documents such as the Domesday Book and as legend has it the crown jewels, but no hard evidence has been found to substantiate this. We learnt how it life in the prison changed once when it moved to holding ‘lifers’; all the cells became single occupancy as ‘lifers’ are given more personal space. When the prison closed in 2013 it was running one of the best rehabilitation courses in the country whose high success rate led to a low re-offending rate. When it closed it was one of the top prisons in the country, but due to its age and design it had a high staffing rate. This very informative tour was followed by a great lunch at the Shepton Brasserie. We are hoping to organise another tour before redevelopment of the prisons starts.